Derek McInnes says none of his Aberdeen squad will be leaving the club as long as they remain in the Europa League. A number of the manager's players, including goalkeeper Jamie Langfield, have been linked with loan moves. McInnes and his squad fly out to Kazakhstan on Tuesday evening ahead of Thursday's third qualifying round first-leg tie against Kairat. "I am not going to let good players leave the club at this moment in time," said the Aberdeen boss. 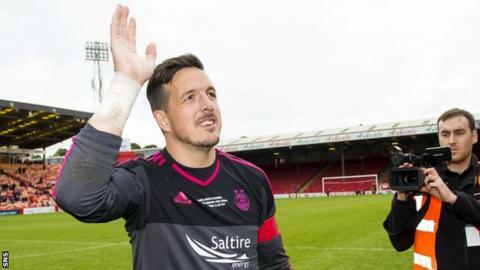 St Mirren are believed to be interested in long-serving Langfield, who had a testimonial at the weekend and has slipped down the pecking order at Pittodrie after the signing of Danny Ward from Liverpool on loan. And 19-year-old forward Lawrence Shankland, who had a spell with Dunfermline Athletic last season, is also attracting interest. "Several clubs have phoned me asking about a few of my players on loan and Lawrence being one of them by a few managers," said McInnes. "No player will be looking to leave while we are still in European competition. "If we get through the tie, we might have to look at the squad again in terms of bringing in numbers and maybe loaning some out. "We always like to get two or three of the younger ones out on loan, but we can't allow anybody to leave the building while there is so much strain on the squad with the demand." Only three senior players have been signed over the summer while 14 have exited McInnes's squad, most of those were not challenging for the first team. "We lost a lot more players than we brought in, but the players we brought in all have qualities and ability to play more regularly in the team and I think we've strengthened those options," said McInnes. "Signing Paul Quinn, Danny Ward and Graeme Shinnie, they have not come here to kick back and be squad players. "It is important that you try to strengthen your starting 11 in couple of positions each season and I think that's what we've brought with these three boys." McInnes was hopeful that last season's Scottish Premiership runners-up could reach the Europa League group stage, challenge in the domestic cup competitions and narrow the gap between themselves and champions Celtic. "We want to try to improve on our league form and we know that's going to be difficult," he said. "It will put a strain on the squad because the squad's smaller, but I think it's better. Celtic, to give any other team encouragement, are probably going to have to achieve less points than they went on to achieve and they are more than capable of repeating that again. "But, if they don't, it is up to other clubs - and we include ourselves in that - to get closer to them."